The Estimated Habitats of Rare Wildlife datalayer contains polygons that are a subset of the Priority Habitats of Rare Species. Estimated Habitats are for use with the Wetlands Protection Act regulations (310 CMR 10.00). The Estimated Habitats of Rare Wildlife datalayer contains polygons that are a subset of the Priority Habitats of Rare Species. They are based on occurrences of rare wetland wildlife observed within the last 25 years and documented in the NHESP database. They do not include those areas delineated as Priority Habitat for rare plants or for rare wildlife with strictly upland habitat requirements. The Estimated Habitats presented here are part of the 14th Edition of the Massachusetts Natural Heritage Atlas, and are effective beginning August 1, 2017. For projects or activities that fall within Estimated Habitats of Rare Wildlife and that require a Notice of Intent (NOI) to be filed under the Wetlands Protection Act, proponents are required to send a copy of the NOI to the Natural Heritage & Endangered Species Program (NHESP). Please note, the Notice of Intent form allows for a streamlined joint Massachusetts Endangered Species Act/Wetlands Protection Act review, and these filings will be reviewed by the NHESP within 30 days. Applicants choosing not to file jointly will be required by the NHESP to submit a separate MESA filing, which may take up to 90 days to review. For more information, please see the Regulatory Review section of the NHESP website. The Estimated Habitats of Rare Wildlife layer is stored in ArcSDE as ESTHAB_POLY. 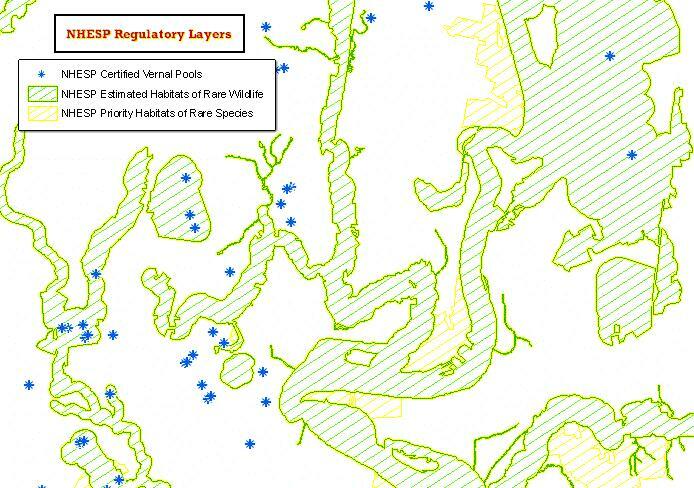 Estimated Habitats were extracted from the Priority Habitats of Rare Species datalayer, which was delineated by NHESP scientists from documented observations of rare species and are based on such factors as species movements and habitat requirements. The polygons were heads-up digitized in ArcGIS 10x and referenced to MassGIS 2013/14 Color Orthophotos. ESTHAB_ID A unique identifier for each polygon. This number may be used to identify an Estimated Habitat polygon when contacting the NHESP. VERSION Indicates the effective date of the Estimated Habitat polygons, as well as the edition of the Natural Heritage Atlas in which they were presented. When viewed with the Priority Habitats of State-Listed Rare Species layer, the Estimated Habitats MUST be shown on top of the Priority Habitats. Using the “NHESP Estimated Habitats of Rare Wildlife” legend, which MUST accompany this datalayer on ALL maps. NOTE: Some Estimated Habitats are less than 1 acre in size. To effectively display these small areas on a map, the line thickness of the polygon may need to be increased. Occurrence records are continually being added, updated, deleted or otherwise modified in the NHESP database. These changes are incorporated into the Estimated Habitats of Rare Wildlife datalayer every four years. View the Estimated Habitats of Rare Wildlife layer in an online map.